No work illustrates the effectiveness of a grass roots campaign as well as that of Edna Buckman Kearns. Not only did Edna labor to bring the campaign for woman suffrage to all Long Islanders via her work as editor of the Brooklyn Daily Eagle, she also passed on the suffrage fervor to her young daughter, Serena, thus insuring the struggle for political equality for women would be carried on by the next generation. Edna Buckman Kearns was born in Pennsylvania, December 25, 1882 to a family of Quakers, (Religious Society of Friends) whose ancestors had arrived in 1682. The Buckman family’s faith was evident in the lives they lived: the extended Buckman family acted as conductors on the Underground Railroad, and Edna’s mother May Begley Buckman was active in the temperance movement. Edna graduated from a Quaker school in Philadelphia; on June 8, 1904 she married Wilmer R. Kearns. The young couple moved to New York City where their oldest daughter Serena was born August 3,1905. Soon after moving to New York Edna began working in local and state suffrage campaigns. The family bought a home in Rockville Centre on Long Island, where Edna hosted meetings and organized activities. She worked as an editor for the Brooklyn Daily Eagle, a publication that was supportive of the suffrage movement, where she used her position to encourage other women to write and speak out about their need for the vote. But she knew that writing about suffrage alone wasn’t enough. 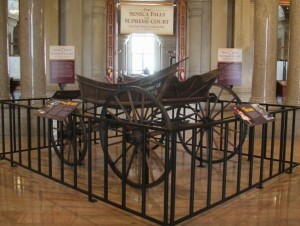 In 1913 the New York State Suffrage Association was offered the gift of an historic horse-drawn wagon, dubbed “The Spirit of 1776.” On July 1, 1913 the wagon took part in its first suffrage parade when it was presented to New York State Suffrage President Harriet May Mills, and later given to Edna Kearns. From that day on the Suffrage Wagon assumed its mantle as a symbol of the suffragists’ cause. It attracted large crowds, and offered a perfect speakers’ platform. With little Serena and other suffragists perched on the wagon’s seat, Edna dressed in colonial clothing and drove the wagon to torchlight meetings, rallies and parades, making speeches, courting publicity for the suffrage cause. Today the history of the woman suffrage movement is enriched by the substantial work of her granddaughter, Marguerite Kearns who maintains an ambitious on-line archive of her grandmother’s work. (See the Suffrage Wagon News Channel, www.suffragewagon.org. )“The Spirit of 1776,” the wagon that figured so prominently in the woman suffrage movement was generously donated by Marguerite and her family to the State of New York where it is housed in the State museum. In 2010 it was exhibited in the lobby of the New York State Capitol. It is hoped that New York State will plan future exhibits of the wonderful symbol for the New York State Suffrage Centennial in 2017. It is a powerful symbol that continues to remind us of the valiant spirit of a woman who would not cease her efforts until political equality was secured for all. Happy Birthday, Edna Buckman Kearns!